I mentioned them yesterday in my Holiday Cookie Extravaganza round-up. 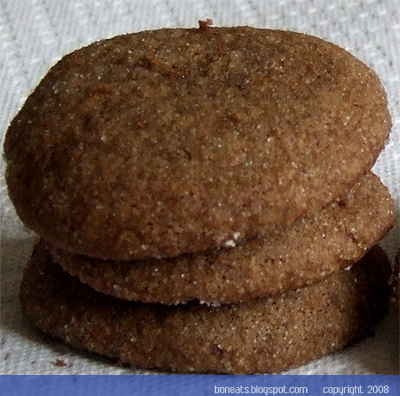 Now here’s the recipe for the Vegan Spiced Molasses cookies. This was my first time baking something vegan. It seemed a little strange, not to be using butter or eggs this time around, and having never baked anything vegan before, I was worried about the end results. Would they end up dry? Would they be too bland? Thankfully, my worries were quickly laid to rest not long after these came out of the oven. The outside had the familiar crunchiness from the sugar coating, while the inside was still warm and soft—just the way I love my ginger cookies! 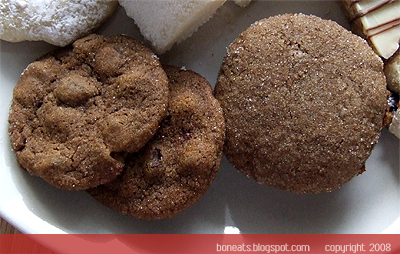 The recipe is actually a mash-up of three different ginger cookie recipes. With a little tweaking here and experimenting there, I came up with a formula that I think I would be happy to make again. 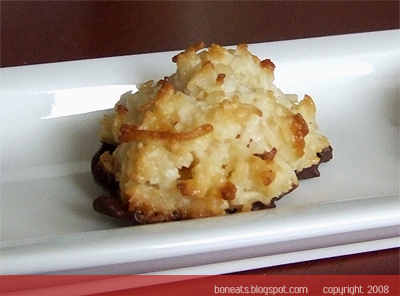 I’ll definitely keep this recipe on file, for those days when I’m craving cookies but have no eggs in the fridge, or to satisfy my vegan friends. ¼ cup granulated sugar, for coating. Preheat the oven to 350°F. If your baking sheets aren’t nonstick, line with parchment paper. Set aside. In a large bowl, sift together all the dry ingredients except for the brown sugar and granulated sugar. Set aside. In another bowl, beat the oil, brown sugar, and freshly grated ginger with an electric mixer, about 2 to 3 minutes. Slowly beat in the molasses, water (or soymilk) and vanilla extract until everything is well incorporated, about 2 minutes. Shape the dough into 1-inch balls and dip in the granulated sugar. Place on the baking sheet, leaving a space of 2 inches between each cookie to allow room for spreading. Flatten the balls slightly with your fingers—the thinner they are, the crispier they will be. Bake in the oven for about 10 minutes. Remove and let cool on cooling racks. ** I like to refrigerate my ginger cookie dough, as it makes the dough less of a sticky mess when I go to roll them into balls. If you’re in a hurry though, you can skip this step. Just make sure you have a bowl of water next to you to keep your hands wet; this will help with the sticky factor. Want to eat cookies too? Go to Food Blogga to find out how, and don't forget to find out what everyone else is baking (and most certainly eating!). Christmas is inarguably my favourite time of the year (as with most people). The holiday cheer, the (corny) holiday music, the holiday spirit…what’s not to love? Best of all, the holiday season means I get to give my inner baker a really good workout. With two large buckets each of flour and sugar, six bars of butter (that’s 12 cups! ), almost three dozen eggs and various spices and sprinkles, I was ready to take on this year’s baking extravaganza. 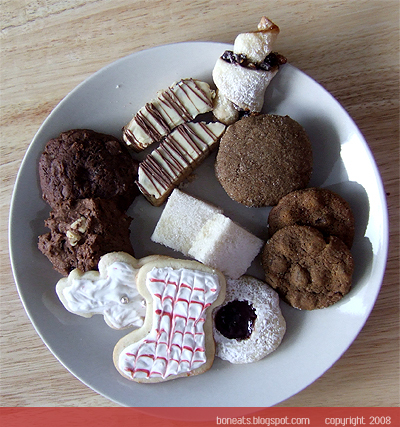 This year’s first batch of holiday cookies consisted of nine varieties. As I had to accommodate some of the people in my class who had allergies, it meant that most of the cookies in this batch were nut-free. 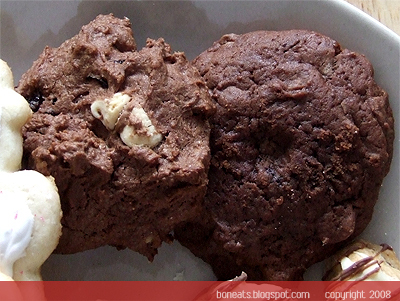 It was hard to narrow down my choices, since a lot of my best (and favourite) cookies contain nuts, but I managed to dig up some nut-free favourites, as well as try my hand at a few new recipes. The first set is the cookies featuring nuts. 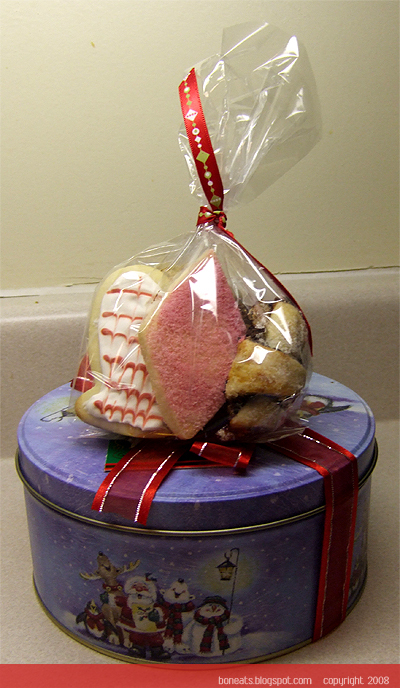 As always, I had to include biscotti in my batch of holiday cookies. To go with the holiday theme, I decided to make Cranberry Pistachio biscotti, which are so beautiful with the green of the nuts and the red of the berries playing off the paleness of the dough. These make wonderful gifts on their own if you dip them in some melted white chocolate, and drizzle a little milk chocolate on top, as I did. The other nut cookie in the batch was another favourite of mine, Rugelach, this time using my own homemade apricot jam and using dried blueberries (I mistakenly took the blueberries to be currants). The next pair of cookies plays off another traditional holiday flavour: gingerbread. 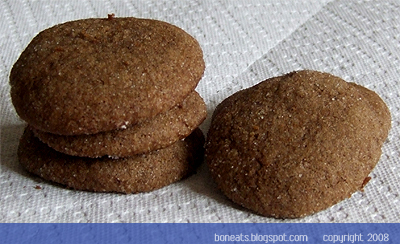 One of them is my personal favourite, Martha’s Chewy Chocolate Ginger, which I recommend everyone should try. It will quickly become your family’s favourite, I assure you! The second ginger cookie (I like to call them Vegan Spiced Molasses) was actually made for my Secret Santa person in my class. As she was a vegan, I kind of mashed together a cookie dough from three different non-vegan recipes and prayed for the best. Luckily, they did turn out. I had some leftover cookies, and I can happily eat these ones and feel slightly less guilty eating them! The third set of cookies highlights butter. 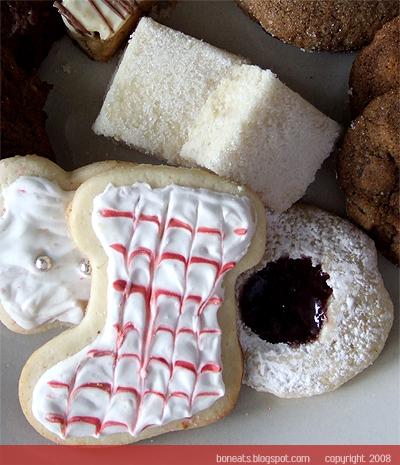 I made melt-in-your-mouth Shortbread, Raspberry Thumbprints and the classic Sugar cookie. I never really decorated my sugar cookies in the past; the most I ever did last year was to get my friends to stick various candy and sprinkles on the cookies before I popped them in the oven. As I flipped through Martha Stewart’s Holiday issue this year, however, I was especially drawn to her perfectly iced sugar cookies (but when are Martha Stewart’s things not perfectly done?!). I made Royal Icing the traditional way with egg whites and what not, but if you’re looking to save time (or just want to stay away from raw eggs), it’s best to get some meringue powder. Because I used egg whites, my royal icing came out a bit stiffer than I would have liked to ice cookies with, and I didn’t achieve the same pretty marbling effects that taunted me from the very pages of MS. The decorating was lots of fun though, allowing me to feed off my creative juices for two hours. Plus I must admit, I’d rather decorate cookies any day than study for exams! The last set of cookies was an ode to all chocolate lovers out there. I actually had the recipe for the Black and White Chocolate Chunk with Cherries for a few years now, but didn’t get around to making them until this year. They were just as delicious as I imagined them to be when I first saw the recipe, with the sweetness of white chocolate balancing the dark richness of the chocolate and the slight tartness of the cherries. As for the Chocolate Malt cookies (a Doris Greenspan recipe), they didn’t turned out as I thought they would (but not in a bad way!. I thought there would be some slight crunch to them, but these are incredibly moist—almost brownie-like in texture. Packed full of cocoa, chocolate-malt powder, chocolate chips, and Maltesers, they are the perfect cookies for any chocolate fan. So, countless number of cups of sugar, flour, two dozen eggs and many pounds of butter later, I was surrounded by about 300 cookies. 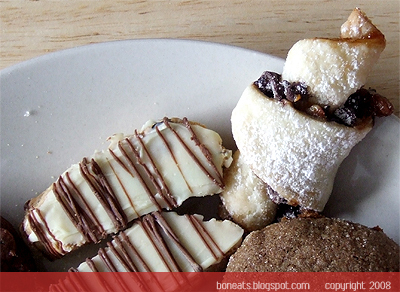 What to do, when a girl with a insatiable sweet tooth is surrounded by that many cookies? Pack them up of course! Santa would be happy that I was good this year, staying away from the majority of the cookies (I did set aside the rejects for myself though) and wrapped them as prettily as I could in plastic treat bags or cookie tins and festive ribbon. Then off I went to spread some holiday cheer. People often ask me why I bake so much, to which I respond with various answers like “I like to bake” or “It’s a stress-reliever.” But the biggest thrill I get is that I can bring a smile to someone’s face with just simple little act of giving a cookie or a slice of cake. And isn’t giving someone a temporary piece of happiness, no matter how fleeting it is, an amazing feeling? Because it’s so true what they say, that the best way to win someone’s heart is through his or her tummy. As I mentioned yesterday, leftover caponata makes for a fantastic base for pasta sauce. This is my bastardized version of pasta alla puttanesca, considering the traditional recipe has no signs of eggplant whatsoever. Simply heat some oil, smashed garlic, red pepper flakes and an anchovy fillet in the pan until fragrant, toss in one chopped tomato and cook for about 2 to 3 minutes, or until the tomato starts to become soft. 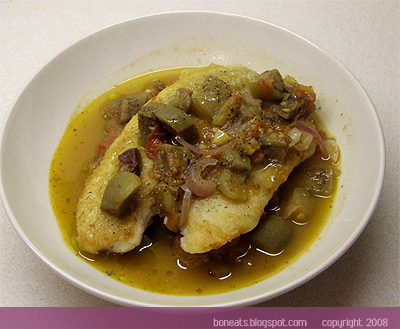 Throw in a couple of tablespoons of the leftover caponata and toss until heated through. I also splashed in some white wine and some heavy cream, along with some leftover edamame I had sitting around in the fridge. Throw in your cooked pasta of choice and toss until coated. You have dinner on the table in minutes! 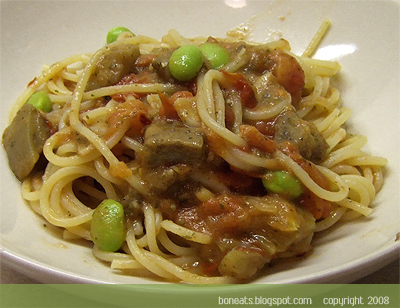 This dish may not be your traditional puttanesca, but it’s still fast, cheap, and easy! Twenty minutes. Take that Rachael. Having been through four years of undergrad, I know how precious time can be. I had little time to eat, let alone sleep, and I would even occasionally find myself scheduling in bathroom breaks. As one can imagine then, meal times were far from being intricate and thrilling. I often gave myself a time limit of 15 minutes or so to get a meal on the table. Anything longer than that, and I would be wasting precious studying time. Thus, I owe a lot of hungry days to soup. I could easily get miso soup ready in less than 10 minutes (with the help of instant dashi—I’m cheating, I know!). All I had to do was boil water, chop up some green onions, tofu and nori sheets, mix in some miso and voilà! Dinner was ready. However, watching Korean dramas during my procrastination sessions recently made me suddenly crave for something spicy and savoury. 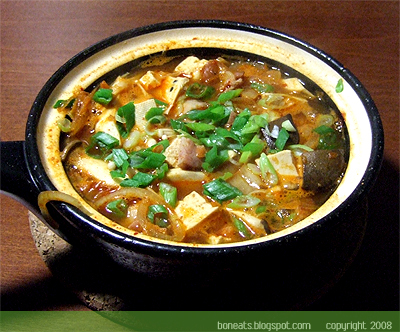 Kimchi jjigae, a spicy Korean stew made with kimchi, green onions, onions, tofu, and sometimes seafood or pork, is quite a common dish in Korea. It’s a hearty homestyle meal that is often shared communally at the centre of the table amongst family or friends, served with steamed white rice and numerous banchan (Korean side dishes). Traditional recipes suggest you use older fermented kimchi because they have more flavour. Kimchi is a traditional dish of Korea (I'd even say it's one of their national dishes). It's basically vegetables that have been fermented in a spice mixture. The most common kimchi variety is the Chinese cabbage variety, but there are many more to choose from, including radishes, chives, cucumber and perilla leaves. Interestingly enough, it's also said to be one of the healthiest things to eat. Besides being low on calories, reports show that one serving of the stuff can provide up to 80% of one's daily required amount of vitamin C and carotene! It also contains numerous lactic acid bacteria, the good bacteria that you can also find in yogurt. My version of kimchi jjigae is far from being authentic at all. After sifting through various recipes, it seems like most recipes include making the broth out of kelp (dried seaweed) and dried anchovies, both of which I did not have in my pantry. Other recipes call for clams. I found a really easy recipe for kimchi jjigae over at My Korean Kitchen as a working basis. Like any homestyle recipe, I personally think its best to tweak it to your own personal tastes. 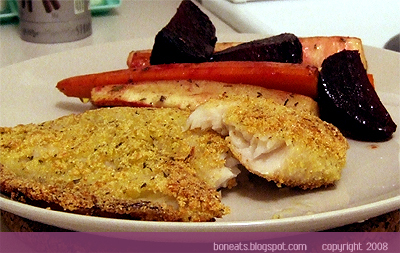 Homestyle cooking is the essence of comfort food, and if you can’t even enjoy what you’re eating, then why bother? Bacon adds a nice smoky depth to the stew, while anchovies makes it more savoury and rich. I also play around with whatever vegetables I have sitting in the fridge at the time. It’s an incredibly flexible recipe that will take own a different flavour each time you make it, depending on what you put into it, but that’s the joy of making this dish. More importantly, the spicy kick really warms the soul, perfect for a day like today, when it’s –20°C outside! And on a side note, don’t you love my personal-size clay pot? It’s adorable, isn’t it? I picked it up for $10! Picked it up at Utsuwa-No-Yakata (“House of Pottery”), a store that specializes in beautiful Japanese tableware, including gorgeous ceramics and pottery. I often frequent this store, and if you’re lucky, you’ll come across one of their frequent sales, a great chance to pick up some great finds for a steal. Thinly slice the onion and green onion. Chop the kimchi and king oyster mushrooms and napa cabbage (if using) into bite-size pieces. Cut the tofu into small cubes. Preheat some vegetable oil in a wok over medium heat. Add the kimchi, and stir until fragrant and heated through. Remove and set aside. Preheat a small, heavy-bottom pot over medium heat. Add the anchovies and stir until most of it has melted down. Add any meat you might be using to the bottom of the pot. Place on top all the other ingredients (kimchi, napa, onion, tofu, chicken stock and sauce) except for the green onion. Raise the heat to medium-high and bring the pot to a boil. Allow to simmer for 5 minutes, or until the vegetables are tender. Stir occasionally to make sure the sauce gets into the stock evenly. Remove from heat and sprinkle green onions on top. Serve immediately with steamed white rice. ** Start with the smaller portion first and adjust to your own taste. Don’t you just love this time of year? The chill in the air, the twinkling lights and sparkly tinsel, carols on the repeat mode… Yes, Christmas has got to be the best time of the year. I’m always excited when I see the first signs of Christmas decorations go up in the malls some time in November, and it’s always a feat to try to hold out whipping my Christmas music stash until after Remembrance Day. But it’s officially December now, and I’m officially in my Christmas celebration mode. To say that this past week has been a nightmare would be a bit of an understatement. School has been sucking up my life with loads of assignments, and it wasn’t until yesterday that I finally handed in my two major projects that have been stressing me out lately. That said, I’ve had little time to sleep these past few weeks, let alone cook, which explains the slowdown in updates around here. 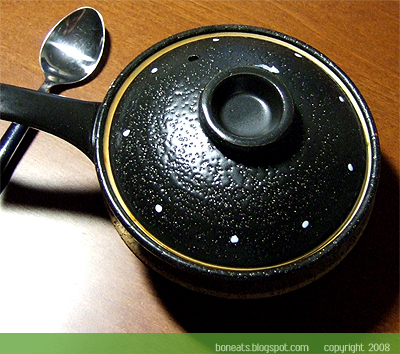 Day after day of miso soup just isn’t very thrilling to blog about, don’t you think? With my assignments handed in, I needed a bit of a celebratory/therapy baking session. Surprisingly, there are quite a few cupcake fans amongst my publishing peers. In the past, I’ve had lots of cookie fans, and a few cheesecake fans. Seldom did I make cupcakes back in Western though, mostly because there wasn’t an outright demand for them, and also because my classes were so small that I would still be left with a dozen cupcakes sitting on my counter (a dangerous situation for a gal who already has a bad enough sweet tooth!). These cupcakes almost never happened. My plan to make these Chocolate Mint Cupcakes (from Cupcake Bakeshop) was almost spoiled last week when a friend in the same class told me she was going to make chocolate mint cupcakes as well. For the past week, I had desperately searched high and low for another awe-inspiring cupcake recipe, but alas, I decided to make these anyway. 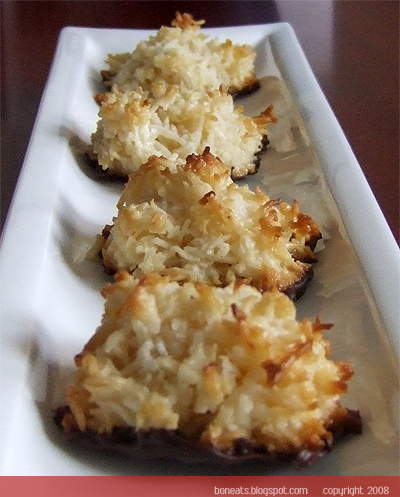 I had been eyeing this recipe for quite some time, and with the holiday season fast upon us, I thought it would be a perfect time for me to finally try them out. 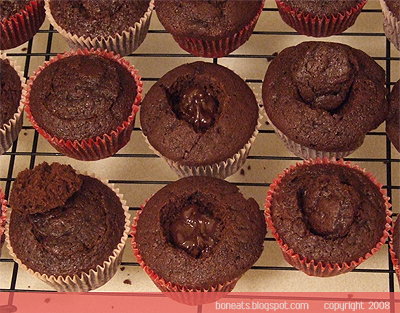 Instead of using the Rich Chocolate Cupcake recipe for these, I reverted to my favourite chocolate cupcake recipe. This cupcake recipe produces an incredibly rich chocolate cake with the perfect crumb—not too dense, but not too light so that it wouldn’t be able to support fillings and toppings. They’re also incredibly moist, and make for a wonderful treat just on their own (preferably with a tall, cold glass of milk!). 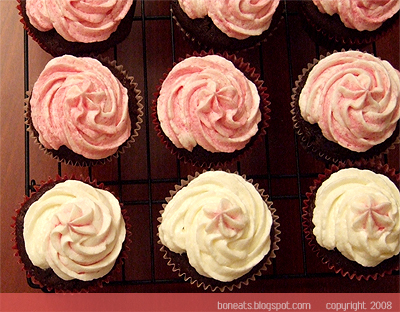 Trust me, these cupcakes will change your life. And if you’ve always been a cake-mix person, I dare you to go back to the boxed thing after trying these. I loved the chocolate-mint ganache filling. 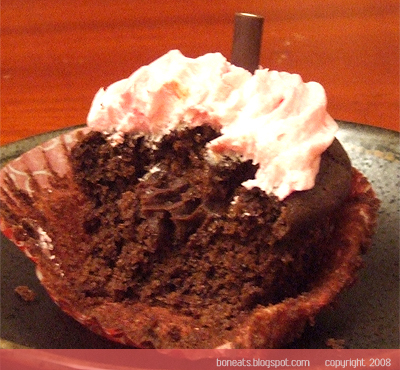 It adds a nice, elegant touch to the cupcake, and makes for a nice surprise to the unsuspected. I followed the suggestion and used fresh mint. You can really tell that it’s fresh mint being used when you bite into the ganache centre. The mint flavour is considerably different—much fresher and almost grassy tasting. I did add a bit more chopped mint to the chocolate ganache than suggested, as well as a few drops of peppermint extract to help boost the mint flavour against the dark chocolate (I really love a more pronounced mint presence in chocolate since I adore the combination so much). I think next time, I’ll make chocolate mint truffles using this method. I’m quite happy how these turned out in the end, except for the ugliness of them with my bad piping and pink frosting and all. However, they were delicious and quite satisfying. Then again, give me anything with chocolate and mint combined and I’m a pretty happy camper! So here’s three cheers to the official start of holiday baking 2008!